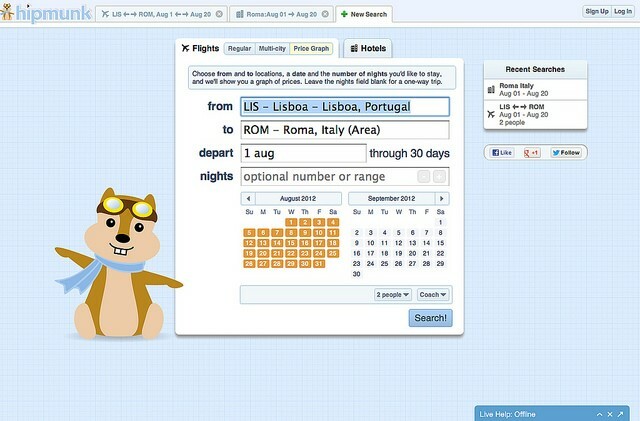 Available on Facebook Messenger, Skype, and Slack, Hipmunk is an AI powered travel chatbot. The chatbot is supposed to make it easier and faster to plan travel on these messaging platforms. Will the chatbot live up to our expectations? Let’s take a look! To start Hipmunk chatbot on Facebook Messenger, you have to select “Get Started.” The chatbot will introduce itself and tell you what it can do. In this case, the chatbot will give you the best deals on flights and hotels. After the introduction, the chatbot will ask you which airport you usually fly from. You can send your location or as a text to the chatbot. Once the chatbot has your location, it will suggest places you can visit. All the places fall under a category such as Roman Empire, Beer Lovers, Coastal States, World’s Best Nightlife to name a few. The chatbot will also display the price below each of these categories. When you select any place the chatbot suggested, it will give you the price of flights from your location to the chosen destination. The chatbot will show you a minimum of nine flights with different prices. If you are not satisfied with what the chatbot has to offer, you can ask it to show you more. You can also ask the chatbot to show flights on weekends or for the entire week. Also, the chatbot will take your preferences into consideration before suggesting flights and hotels. For example, if you select cheapest, the chatbot will only show flights and hotels that won’t burn a hole in your wallet. When the chatbot displays various destinations, you can check the prices of different hotels. If you want notifications on the change in the price of flights, you can set a fare alert on Facebook Messenger. You can also book return flights with the help of this chatbot. If you want to see the flight details, the chatbot will redirect you to Hipmunk’s official page. On the official page, you can set fare alerts, add the flight date to your calendar, and get the itinerary. You can also search for flights and hotels by typing hotels in New York City or flights from Singapore. You also have the option of asking Hipmunk chatbot for travel advice. For example, you can ask the chatbot when is the best time to fly from London to New York City. You can also tell it that you want to get out of Singapore or that you are looking for a beach vacation in Hawaii on August 10th to August 15th. When you ask the chatbot what is the best time to fly from Japan to Singapore, you will get a list of flights on different dates. The developers added natural language processing to Hipmunk chatbot. As a result of this, it is quite easy to use Hipmunk chatbot. Although the chatbot is efficient, it does take some time to give you information regarding flights, hotels, and travel advice. If you don’t use the chatbot for some time, the chatbot will message and tell you that it can help you make a great escape from any city! Overall, Hipmunk is a well-designed chatbot available on Facebook Messenger, Skype and Slack. The chatbot can help you find flights and hotels, based on your preferences. The chatbot gives you a myriad of options when you have to choose from flights and hotels. You can set price alerts on the chatbot, a feature not many chatbots have. You also get travel advice on Hipmunk Chatbot. Do give Hipmunk chatbot a try on Facebook Messenger, Skype or Slack!